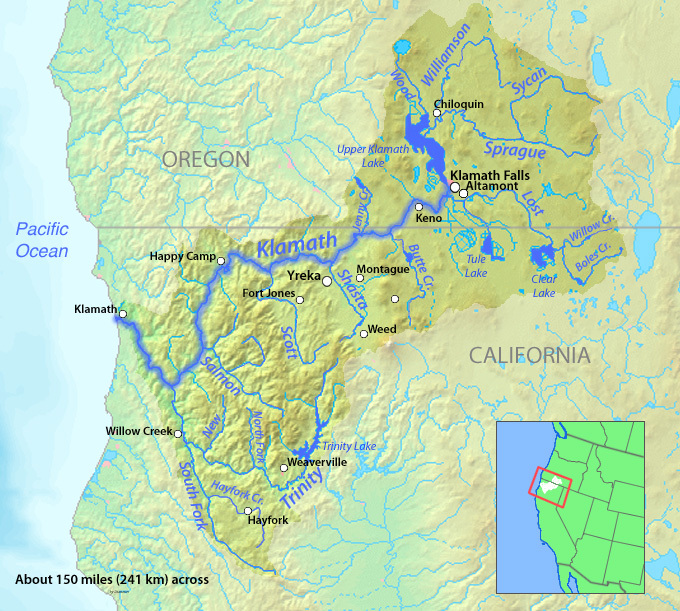 Map of the Klamath River watershed in northern California and south-central Oregon, that drains to the Pacific. For much of its modern history, the timeless Klamath River has been threatened But this irrepressible coastal titan will soon be recognized for being the object of what promises to be one of the most successful river restorations ever undertaken. 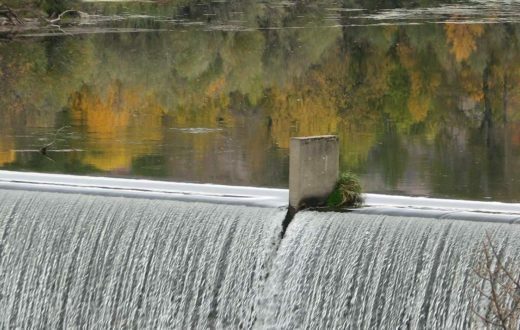 That river-restoration project is slated to begin in 2020, a decade after American Rivers signed historic agreements to remove four dams and restore access to more than 350 miles of salmon habitat on the Klamath River. 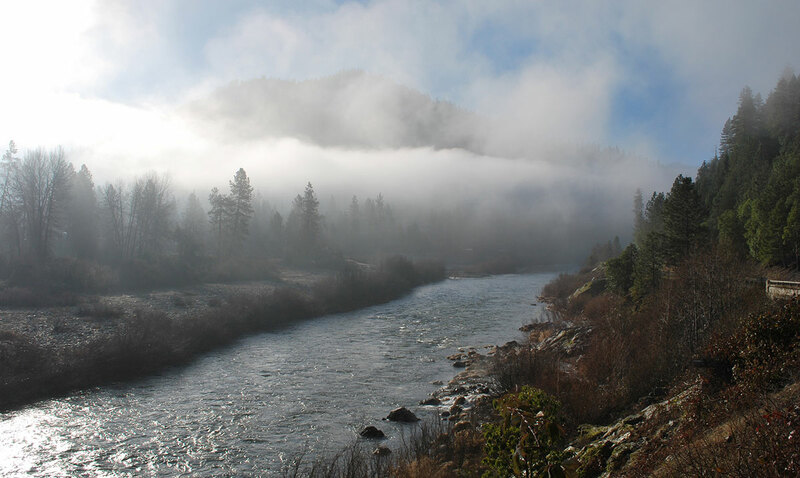 After earning inclusion on American Rivers’ Most Endangered Rivers® list from 1987-1990 and again in 2002-2003, the Klamath is poised to live up to its potential as the longest Wild and Scenic River designated in California. One of the Klamath River’s “outstandingly remarkable values,” as the Wild and Scenic Rivers Act refers to the attributes that are required for WSR designation, is its anadromous fishery. Chinook and coho salmon, steelhead and coastal cutthroat trout, green and white sturgeon, and Pacific lamprey all rely on the Klamath during their freshwater life stages. The river once supported the third-largest salmon run on the West Coast. While the fish (and fishing) have suffered from dams, diversions, and water quality issues, the Klamath still overflows with scenery and recreation. Originating near Crater Lake in southern Oregon, the river’s remote, rugged rapids transect the Cascade Mountains at the California border. Between dams, the Klamath includes some of the longest free-flowing stretches of river in California, including exceptional whitewater ranging from Class II to Class V (and one Class VI at Ishi Pishi Falls) as it wends its way through the Coastal Range and empties into the Pacific south of Crescent City. Wild and Scenic tributaries at the Scott and Cal Salmon offer more outstanding paddling and recreation. Habitat is wide and varied as the Klamath flows from the high-desert interior through coastal rainforest to the Pacific Ocean, supporting abundant wildlife, agriculture, and sustenance for at least three Native American tribes. 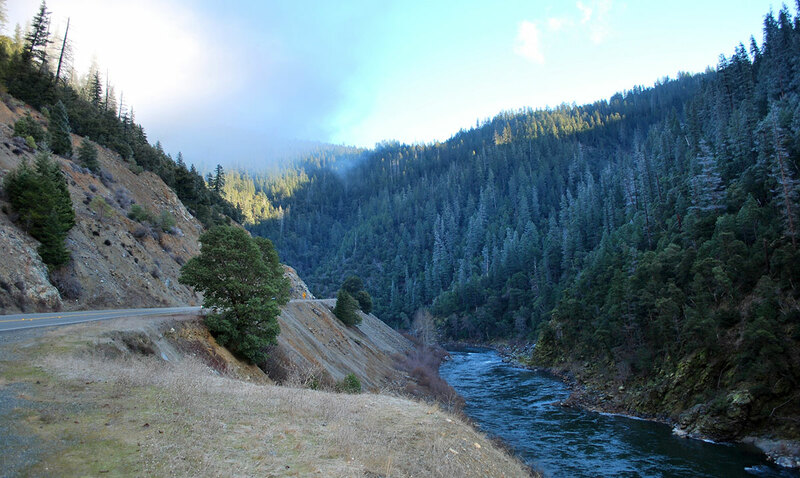 The Klamath River Canyon has been sacred to Native Americans for some 7,000 years, providing both physical and metaphysical nourishment as a fishery and a location for vision quests, curing ceremonies, and spiritual preparation. Their way of life was drastically altered when a series of four hydropower dams built between 1908 and 1962 cut off hundreds of miles of salmon spawning and rearing habitat in the Klamath’s upper drainage. Disputes over river management in the basin go back several decades. 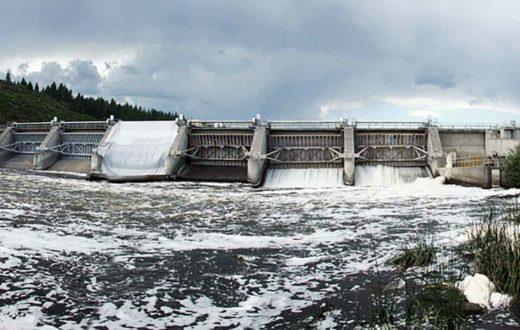 The dams produce only a nominal amount of power and their impacts are compounded by ecologically abusive irrigation practices in the river’s headwaters. Toxic conditions in the reservoirs behind the dams threaten the health of people as well as fish. Today, salmon and steelhead runs are just a fraction of their historic abundance, with some near extinction. All Klamath Basin communities are suffering in some way, including tribes, farmers, commercial fishermen, and others. 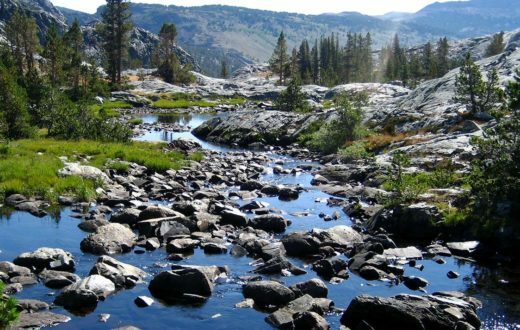 Conservation groups and native tribes have proposed broad changes to water use in the Klamath Basin, primarily focused on the removal of those four hydropower dams to expand fish habitat. The resulting Klamath Basin Restoration Agreement endorsed by the U.S. Department of the Interior was signed in 2010. 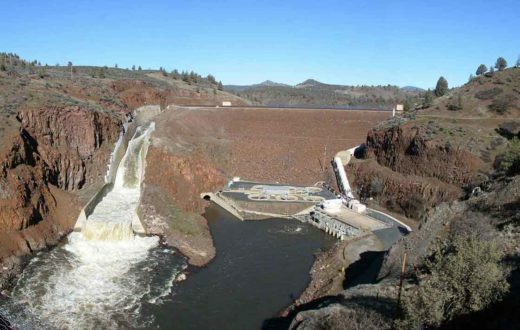 The agreement will transfer ownership of PacifiCorp’s four dams to a new entity, the Klamath River Renewal Corporation, with the goal of removing the dams beginning in 2020. Dam removal will improve water quality and open access to hundreds of miles of habitat for endangered salmon and steelhead, ideally resolving lingering disputes over water in the basin and providing greater economic security for fishing, tribal, and agricultural communities. 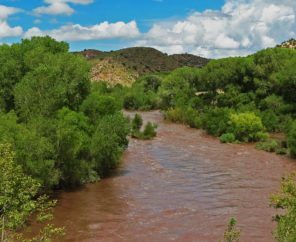 There have been projects with taller dams or more miles of habitat restored. But considered as a whole, the Klamath is arguably America’s most significant dam removal and river restoration effort. Klamath River at Hopkins Creek, CA. The Southern Oregon/Northern California Coast coho is federally listed as a threatened species under the Endangered Species Act. Low water flows in September, 2002, led to the death of an estimated 34,000-70,000 chinook, coho, and steelhead on the Klamath, making it the largest salmon kill in the history of the American West. 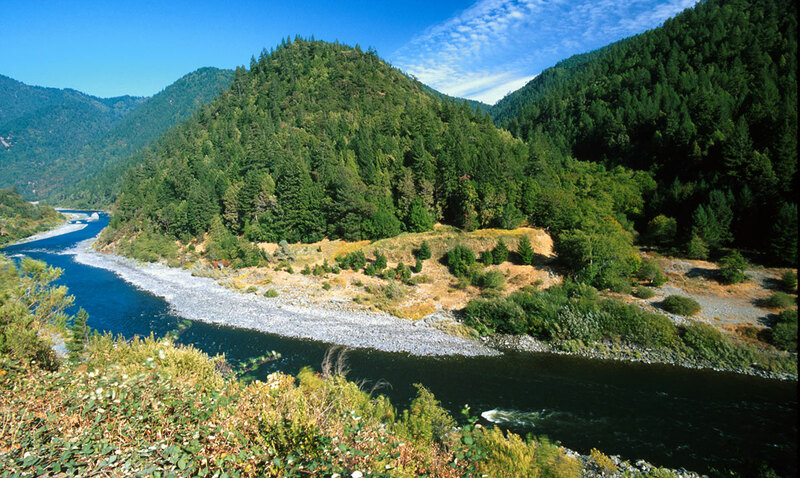 With 286 miles classified as wild, scenic or recreational, the Klamath is longest Wild and Scenic River in California. Another 11 miles of the upper Klamath are designated in Oregon. 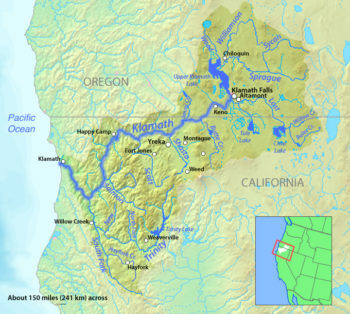 The Klamath River watershed is as big as Massachusetts and Connecticut combined. Could This Be the World’s Biggest Dam Removal?